In this chapter, we will adopt the formal framework of "generative grammar", in which a "language" is considered to be nothing more than an enormous collection of all grammatical sentences, and a grammar is a formal notation that can be used for "generating" the members of this set. Grammars use recursive productions of the form S → S and S, as we will explore in 3. In 10. we will extend this, to automatically build up the meaning of a sentence out of the meanings of its parts. (2) While hunting in Africa, I shot an elephant in my pajamas. How he got into my pajamas, I don't know. 2 What's the Use of Syntax? In 2.1, we systematically substitute longer sequences by shorter ones in a way which preserves grammaticality. Each sequence that forms a unit can in fact be replaced by a single word, and we end up with just two elements. Figure 2.1: Substitution of Word Sequences: working from the top row, we can replace particular sequences of words (e.g. the brook) with individual words (e.g. it); repeating this process we arrive at a grammatical two-word sentence. In 2.2, we have added grammatical category labels to the words we saw in the earlier figure. 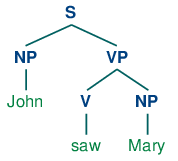 The labels NP, VP, and PP stand for noun phrase, verb phrase and prepositional phrase respectively. 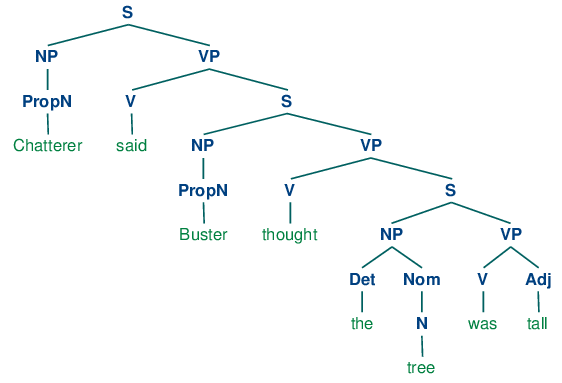 Figure 2.2: Substitution of Word Sequences Plus Grammatical Categories: This diagram reproduces 2.1 along with grammatical categories corresponding to noun phrases (NP), verb phrases (VP), prepositional phrases (PP), and nominals (Nom). As we saw in 1, sentences can have arbitrary length. 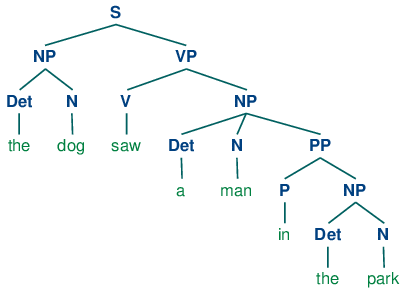 Consequently, phrase structure trees can have arbitrary depth. The cascaded chunk parsers we saw in 4 can only produce structures of bounded depth, so chunking methods aren't applicable here. Let's start off by looking at a simple context-free grammar. By convention, the left-hand-side of the first production is the start-symbol of the grammar, typically S, and all well-formed trees must have this symbol as their root label. In NLTK, context-free grammars are defined in the nltk.grammar module. In 3.1 we define a grammar and show how to parse a simple sentence admitted by the grammar. The grammar in 3.1 contains productions involving various syntactic categories, as laid out in 3.1. 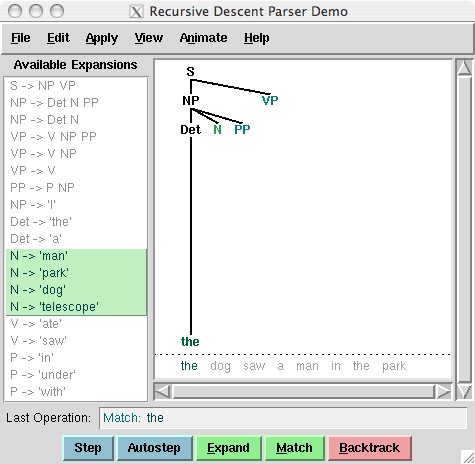 Figure 3.2: Recursive Descent Parser Demo: This tool allows you to watch the operation of a recursive descent parser as it grows the parse tree and matches it against the input words. Your Turn: Try developing a simple grammar of your own, using the recursive descent parser application, nltk.app.rdparser(), shown in 3.2. It comes already loaded with a sample grammar, but you can edit this as you please (using the Edit menu). Change the grammar, and the sentence to be parsed, and run the parser using the autostep button. Make sure that you put a .cfg suffix on the filename, and that there are no spaces in the string 'file:mygrammar.cfg'. If the command print(tree) produces no output, this is probably because your sentence sent is not admitted by your grammar. In this case, call the parser with tracing set to be on: rd_parser = nltk.RecursiveDescentParser(grammar1, trace=2). You can also check what productions are currently in the grammar with the command for p in grammar1.productions(): print(p). A grammar is said to be recursive if a category occurring on the left hand side of a production also appears on the righthand side of a production, as illustrated in 3.3. The production Nom -> Adj Nom (where Nom is the category of nominals) involves direct recursion on the category Nom, whereas indirect recursion on S arises from the combination of two productions, namely S -> NP VP and VP -> V S.
We've only illustrated two levels of recursion here, but there's no upper limit on the depth. You can experiment with parsing sentences that involve more deeply nested structures. Beware that the RecursiveDescentParser is unable to handle left-recursive productions of the form X -> X Y; we will return to this in 4. The recursive descent parser builds a parse tree during the above process. With the initial goal (find an S), the S root node is created. As the above process recursively expands its goals using the productions of the grammar, the parse tree is extended downwards (hence the name recursive descent). We can see this in action using the graphical demonstration nltk.app.rdparser(). Six stages of the execution of this parser are shown in 4.1. Figure 4.1: Six Stages of a Recursive Descent Parser: the parser begins with a tree consisting of the node S; at each stage it consults the grammar to find a production that can be used to enlarge the tree; when a lexical production is encountered, its word is compared against the input; after a complete parse has been found, the parser backtracks to look for more parses. The shift-reduce parser repeatedly pushes the next input word onto a stack (4.1); this is the shift operation. If the top n items on the stack match the n items on the right hand side of some production, then they are all popped off the stack, and the item on the left-hand side of the production is pushed on the stack. This replacement of the top n items with a single item is the reduce operation. This operation may only be applied to the top of the stack; reducing items lower in the stack must be done before later items are pushed onto the stack. The parser finishes when all the input is consumed and there is only one item remaining on the stack, a parse tree with an S node as its root. The shift-reduce parser builds a parse tree during the above process. Each time it pops n items off the stack it combines them into a partial parse tree, and pushes this back on the stack. We can see the shift-reduce parsing algorithm in action using the graphical demonstration nltk.app.srparser(). Six stages of the execution of this parser are shown in 4.2. 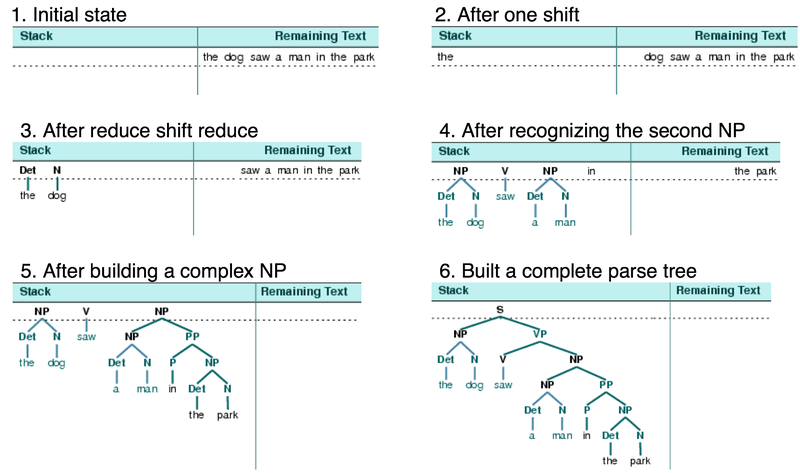 Figure 4.2: Six Stages of a Shift-Reduce Parser: the parser begins by shifting the first input word onto its stack; once the top items on the stack match the right hand side of a grammar production, they can be replaced with the left hand side of that production; the parser succeeds once all input is consumed and one S item remains on the stack. c. NP -> "John" | "Mary" | "Bob"
A left-corner parser is a top-down parser with bottom-up filtering. Unlike an ordinary recursive descent parser, it does not get trapped in left recursive productions. Before starting its work, a left-corner parser preprocesses the context-free grammar to build a table where each row contains two cells, the first holding a non-terminal, and the second holding the collection of possible left corners of that non-terminal. 4.1 illustrates this for the grammar from grammar2. Let's set our input to be the sentence in (2). The numerically specified spans of the WFST are reminiscent of Python's slice notation (3.2). Another way to think about the data structure is shown in 4.3, a data structure known as a chart. Figure 4.3: The Chart Data Structure: words are the edge labels of a linear graph structure. In a WFST, we record the position of the words by filling in cells in a triangular matrix: the vertical axis will denote the start position of a substring, while the horizontal axis will denote the end position (thus shot will appear in the cell with coordinates (1, 2)). To simplify this presentation, we will assume each word has a unique lexical category, and we will store this (not the word) in the matrix. So cell (1, 2) will contain the entry V. More generally, if our input string is a 0 a 1 ... a n, and our grammar contains a production of the form A → a i, then we add A to the cell ( i , `i`+1). For our WFST, we create an (n-1) × (n-1) matrix as a list of lists in Python, and initialize it with the lexical categories of each token, in the init_wfst() function in 4.4. We also define a utility function display() to pretty-print the WFST for us. As expected, there is a V in cell (1, 2). Returning to our tabular representation, given that we have Det in cell (2, 3) for the word an, and N in cell (3, 4) for the word elephant, what should we put into cell (2, 4) for an elephant? We need to find a production of the form A → Det N. Consulting the grammar, we know that we can enter NP in cell (2, 4). Figure 4.5: The Chart Data Structure: non-terminals are represented as extra edges in the chart. We conclude that there is a parse for the whole input string once we have constructed an S node in cell (0, 7), showing that we have found a sentence that covers the whole input. The final state of the WFST is depicted in 4.5. Finally, the WFST did not represent the structural ambiguity in the sentence (i.e. the two verb phrase readings). The VP in cell (1, 7) was actually entered twice, once for a V NP reading, and once for a VP PP reading. These are different hypotheses, and the second overwrote the first (as it happens this didn't matter since the left hand side was the same.) Chart parsers use a slighly richer data structure and some interesting algorithms to solve these problems (see the Further Reading section at the end of this chapter for details). A dependency representation is a labeled directed graph, where the nodes are the lexical items and the labeled arcs represent dependency relations from heads to dependents. 5.1 illustrates a dependency graph, where arrows point from heads to their dependents. Figure 5.1: Dependency Structure: arrows point from heads to their dependents; labels indicate the grammatical function of the dependent as subject, object or modifier. The arcs in 5.1 are labeled with the grammatical function that holds between a dependent and its head. 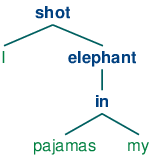 For example, I is the SBJ (subject) of shot (which is the head of the whole sentence), and in is an NMOD (noun modifier of elephant). 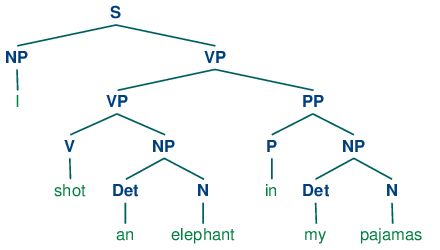 In contrast to phrase structure grammar, therefore, dependency grammars can be used to directly express grammatical functions as a type of dependency. A dependency graph is projective if, when all the words are written in linear order, the edges can be drawn above the words without crossing. This is equivalent to saying that a word and all its descendents (dependents and dependents of its dependents, etc.) form a contiguous sequence of words within the sentence. 5.1 is projective, and we can parse many sentences in English using a projective dependency parser. The next example shows how groucho_dep_grammar provides an alternative approach to capturing the attachment ambiguity that we examined earlier with phrase structure grammar. Let us take a closer look at verbs and their dependents. The grammar in 3.3 correctly generates examples like (15d). In the tradition of dependency grammar, the verbs in 5.1 are said to have different valencies. Valency restrictions are not just applicable to verbs, but also to the other classes of heads. Now *Joe thought the bear is excluded since we haven't listed thought as a TV, but Chatterer saw the bear is still allowed. 5.2 provides more examples of labels for verb subcategories. Valency is a property of lexical items, and we will discuss it further in 9..
We can use this data to help develop a grammar. For example, the program in 6.1 uses a simple filter to find verbs that take sentential complements. Assuming we already have a production of the form VP -> Vs S, this information enables us to identify particular verbs that would be included in the expansion of Vs.
Now we can try parsing a longer sentence, fish fish fish fish fish, which amongst other things, means 'fish that other fish fish are in the habit of fishing fish themselves'. We use the NLTK chart parser, which was mentioned earlier in this chapter. This sentence has two readings. As the length of this sentence goes up (3, 5, 7, ...) we get the following numbers of parse trees: 1; 2; 5; 14; 42; 132; 429; 1,430; 4,862; 16,796; 58,786; 208,012; ... (These are the Catalan numbers, which we saw in an exercise in 4). The last of these is for a sentence of length 23, the average length of sentences in the WSJ section of Penn Treebank. For a sentence of length 50 there would be over 1012 parses, and this is only half the length of the Piglet sentence (1), which young children process effortlessly. 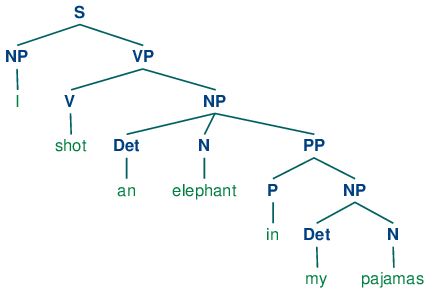 No practical NLP system could construct millions of trees for a sentence and choose the appropriate one in the context. It's clear that humans don't do this either! So much for structural ambiguity; what about lexical ambiguity? As soon as we try to construct a broad-coverage grammar, we are forced to make lexical entries highly ambiguous for their part of speech. In a toy grammar, a is only a determiner, dog is only a noun, and runs is only a verb. However, in a broad-coverage grammar, a is also a noun (e.g. part a), dog is also a verb (meaning to follow closely), and runs is also a noun (e.g. ski runs). In fact, all words can be referred to by name: e.g. the verb 'ate' is spelled with three letters; in speech we do not need to supply quotation marks. Furthermore, it is possible to verb most nouns. Thus a parser for a broad-coverage grammar will be overwhelmed with ambiguity. Even complete gibberish will often have a reading, e.g. the a are of I. As (Klavans & Resnik, 1996) has pointed out, this is not word salad but a grammatical noun phrase, in which are is a noun meaning a hundredth of a hectare (or 100 sq m), and a and I are nouns designating coordinates, as shown in 6.2. Figure 6.2: "The a are of I": a schematic drawing of 27 paddocks, each being one "are" in size, and each identified using coordinates; the top left cell is the a "are" of column I (after Abney). Even though this phrase is unlikely, it is still grammatical and a broad-coverage parser should be able to construct a parse tree for it. Similarly, sentences that seem to be unambiguous, such as John saw Mary, turn out to have other readings we would not have anticipated (as Abney explains). This ambiguity is unavoidable, and leads to horrendous inefficiency in parsing seemingly innocuous sentences. The solution to these problems is provided by probabilistic parsing, which allows us to rank the parses of an ambiguous sentence on the basis of evidence from corpora. 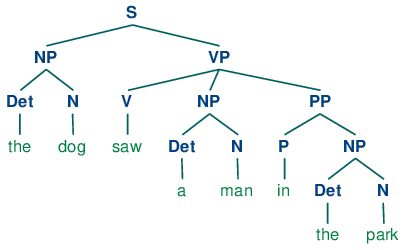 Using the Penn Treebank sample, we can examine all instances of prepositional dative and double object constructions involving give, as shown in 6.3. The simplest way to define a PCFG is to load it from a specially formatted string consisting of a sequence of weighted productions, where weights appear in brackets, as shown in 6.4. Extra materials for this chapter are posted at http://nltk.org/, including links to freely available resources on the web. For more examples of parsing with NLTK, please see the Parsing HOWTO at http://nltk.org/howto. (Burton-Roberts, 1997) is a practically oriented textbook on how to analyze constituency in English, with extensive exemplification and exercises. (Huddleston & Pullum, 2002) provides an up-to-date and comprehensive analysis of syntactic phenomena in English. ◑ You can modify the grammar in the recursive descent parser demo by selecting Edit Grammar in the Edit menu. Change the second expansion production, namely NP -> Det N PP, to NP -> NP PP. Using the Step button, try to build a parse tree. What happens? Write a program to find those verbs in the Prepositional Phrase Attachment Corpus nltk.corpus.ppattach. Find any cases where the same verb exhibits two different attachments, but where the first noun, or second noun, or preposition, stay unchanged (as we saw in our discussion of syntactic ambiguity in 2). ◑ Write a program to compare the efficiency of a top-down chart parser compared with a recursive descent parser (4). Use the same grammar and input sentences for both. Compare their performance using the timeit module (see 4.7 for an example of how to do this). ◑ Consider the algorithm in 4.4. Can you explain why parsing context-free grammar is proportional to n 3, where n is the length of the input sentence.